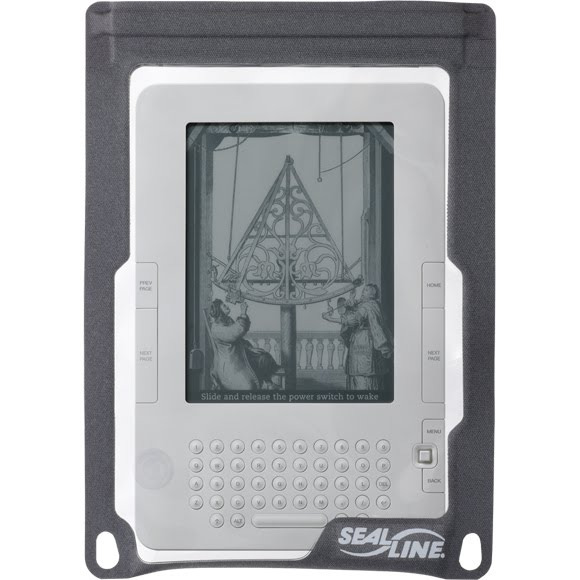 The eSeries 14 case accommodates a broad array of popular e-readers with all-condition protection while preserving full voice, and touchscreen function. It features special patterning that allows access to all controls, a flexible toggle dome for Kindle 2 users and full touchscreen sensitivity to ensure full protection without a single compromise in the operation of your device. Meets IPX-7 standards of submersion at 1 meter for 30 minutes, ensuring total protection from the elements. Ultra-clear and supple urethane windows allow use of all touchscreen, camera and voice functions. Unquestionable reliability ensures peace of mind. Proprietary, easy-to-use SealLock closure takes up little space for easy transport anywhere. Die-cut lash points at corners provide tethering options for high adventure or total convenience. Measurements Overall: 6.9" x 9.8", Compartment: 5.6" x 8.75"